I happened to heard this song from the Radio Station and was curious to know who sang this beautiful song. After doing some research, I was so surprised that the male singer is none other than Eric Suen and his singing had improved! This guy is simply amazing because years have passed and he still look good. This duet - 幸福的忘记 was sang by Rachel Liang and Eric Suen and I really love this song! I still remembered Eric Suen as a teens heartthrob in the 90s alongside with Jimmy Lin and Daniel Chan. Is it a trend for the famous idols in the 90s to make a comeback? That seem to be the case lately in Taiwanese idol drama. None of them have really aged, rather they have grown more matured than before. Those were the times when I was still studying in elementary school and I used to like Mandopop (Chinese Music). Eric Suen is a good singer and I am glad to see him again after taking a long break in the music industry. In addition, he acted in an Taiwanese Idol drama - The birth of the Queen. 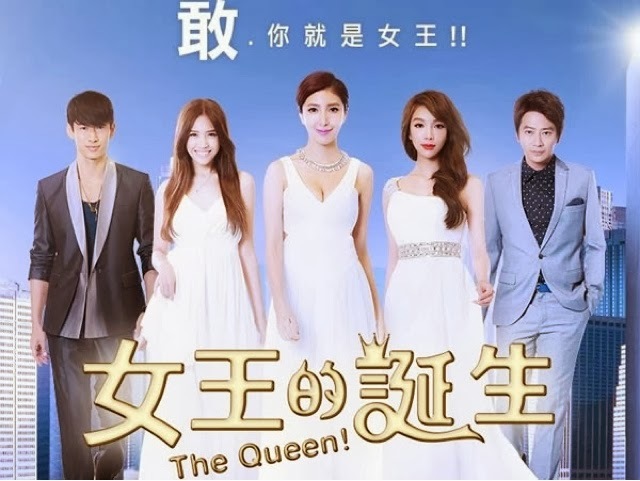 When i saw the title of the show, i was thinking not another drama about Queen again? Recently, there are many drama about Queen and Princess. The story line of this drama seem to be a little shallow but I decided to give it a try since there wasn't any outstanding Taiwanese Idol drama for a long time. Cheryl Yang seemed to be stereotype into the role of a Queen. I remembered she acted in My Queen co-starring Ethan Ruan and I think her acting was good in that show. However, that cannot be said about her performance in this drama. Cheryl Yang seem to overact in her role and was too exaggerated for my liking. I think the script itself does not do justice to her acting abilities. There was not much character development in her role, or rather it took a long time for her character to move on in this drama. There were times when I felt that it was tiring to watched her jumping into the same pit of hole over and over again. My patience gradually ran out and I wondered why is the story plot repeating itself over and over again in this past ten over episodes. The scriptwriter make her character so silly and naive. It was rather unrealistic or impractical for a thirty years old model to behave childishly and expect viewers to root for this struggling underdog character. I don't blame her for accepting this role, I think she did moderately well within a not so well written script. In fact, she is a good actress who look stunning. Cheryl really tried her best to portray an 'old' model Mabel who is still searching for frame and her own identity. Janel Tsai portrayed an arrogant supermodel - Judy. She is like a pretty vase, portraying the same expression in almost half of the show. Later on in the drama, Janel began to show more of her manipulative and scheming side when she began to be jealous of Mabel. I knew there is something deeper than her pretty appearance and I think Janel did a good job with her role. She is like an Ice queen that carries a weapon everywhere. Anytime, she can back stab you at the back. Janel began to show more of her acting skills at the later part of the show when her insecurity and her unsettled relationship with Feng Ming Tai sets in and triggered her to scheme against Mabel. Judy confused and fragile inner self caused her to get involved with Feng Ming Tai half brother. That was Judy's biggest mistake. Nita Lai showed potential in her acting skills. She is raw in her acting simply because she is a new actress. However, she still stood on her own ground among her seniors. She is good in playing her villain role, who does not bat an eyelid in doing evil to others in order to benefit herself and achieve her motives. Her role as Du Xiao Wei is an ambitious Supermodel wannabe who dream of marrying a rich man and live like a Queen. She will resort to anything, even allies with Judy (Janel character) to climb up the ladder. Since this is a drama about Queen, can the Kings (male leads) shine in this drama too? I think ocassionally the male leads were overshadowed by the glamour of their female counterparts. There were times when these poor male leads were sandwiched between the rivalry of 'The Queens'. Eric Suen character as Feng Ming Tai only exhibit a cool exterior and he suffered the same fate as Cheryl in terms of character development. His canto accent mandarin does not bother me. In fact, i think his mandarin is already very good for a Hong Kong celebrity and his English is even better. I looked forward to Eric Suen performance in this drama and I was a little disappointed here. He fitted into the role of a charming, rich and highly educated man. However, he does not have much chemistry with Cheryl even when he act as undercover (Dennis), armed with a hidden agenda and moved into Mabel house. Yes, there were some funny and comical moments such as him getting jealous over Mabel relationship with Yang Rui. Both Mabel and Feng Ming Tai different living habits, characters, values, social status and outrageous situations makes the show interesting. The interactions between the two leads were quite enjoyable and funny too. Furthermore, there was also some romantic scenes between them, but I never truly see how Mabel and Feng Ming Tai develop that inseparable love. I know they will eventually realized how much they love each other and even end up together but their development is pretty slow pace or rather lack of some chemistry. Above all, it is the chalky pacing of the drama which focus on some unnecessary things that got me frustrated at times. Johnny Lu is natural in his role, especially the part where he rejected Du Xiao Wei advance. He demonstrated his acting skills in a quiet manner. The good thing is that he does not overact his role and came across as a decent actor whose acting is watchable. On the other hand, Phoebe Huang did a great job as Vivi, the manager of the Modeling agency and Mabel good friend. Her performance is impressionable and consistent throughout the show. This is a drama about how a woman can be a Queen in her own right without depending on others. The scriptwriter tried to build their story around this topic but it falls flat. The cast look promising but the story line is a little draggy and repetitively boring (More new ideas please!). If you are looking for an amazing story line, you will be disappointed. However, if you just want to look at eye candies and leggy supermodels, I would recommend this drama. In my opinion, The Queen is an average idol drama with some touching and light-hearted moments, just don't expect too much. At least the original soundtrack by Eric Suen is great! Listen to the songs written by Tank if you have no interest in this drama. Anyone know the opening song? !